Looking for a game that will help you get your reaction times on the next level while letting you have fun in the same time? What kind of game is offering all of this? Finding and choosing this kind of game that will test and challenge your skills while offering you endless fun as you play is not very easy among so many games created daily. And because of that, we searched and we have the best game of this kind – Codots. Let’s see what the game is all about. What is Codots all about? 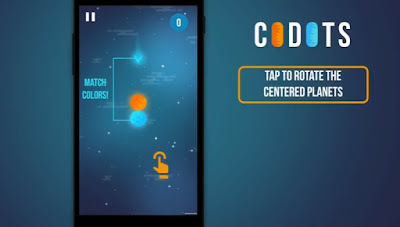 The Codots game is developed for android users that like to play simple and yet challenging games on their phones, easy and fun way to test the reaction time they have and better it along the way. With playing this casual game with endless space gameplay, players get to become faster and precise every time they play while enjoying the amazing sharp graphics and the gorgeous space design. The players will the fastest skills and the players will the most progress will get high scores for their achievements, comparing it with the ones from friends and becoming the ultimate and best player of the space game. All features offered by this fun and addictive space game are completely getting player addicted and pushing him in the same time to test his reaction time and become better in playing. On the game, players need to become fast as they can if they want to progress. With only one task for completing, players just need to rotate the dots from the center in order to collect all matching obstacles that are coming towards the dots from different directions. With every progress of the player, the game becomes faster and so the player needs to react faster. Also, the game is offering power-ups that can be used for slowing the game down if the player needs to. To make the game more interesting there are 4 game modes and each one has different mechanics for the dots and different obstacles in colors and different directions. These modes the player can unlock and enjoy the endless fun and constantly new challenges on his way to victory. Players can compare scores and try to beat each other’s scores. Download it now for free on Google Play and challenge yourself!